The Chicago International Charter Schools board voted on Wednesday to keep open the ChicagoQuest campus, but eliminate its elementary grades and change the focus of the school. 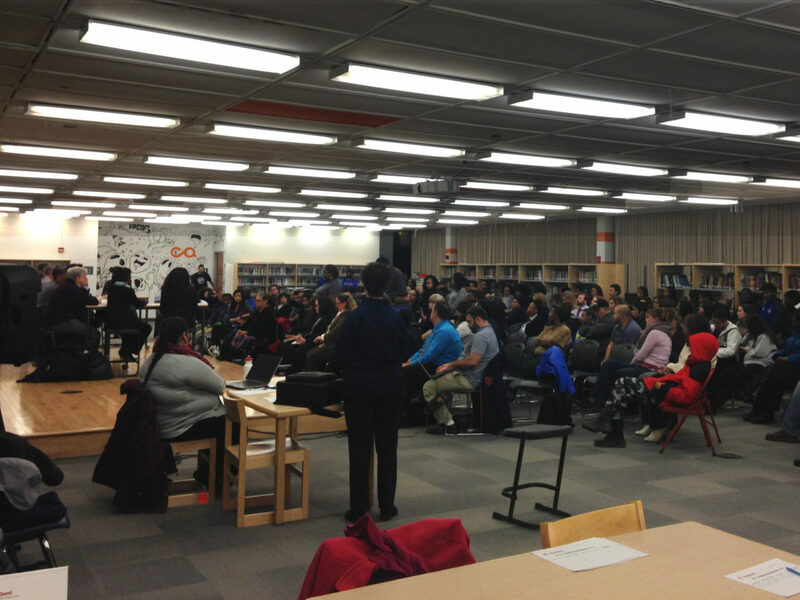 They earnestly debated that option, along with three alternatives, in front of about 200 students, parents and teachers who filled the library of ChicagoQuest, which serves middle and high school grades in the Near North Side. In the end, CICS board members narrowly voted to keep ChicagoQuest open. But they also decided to eliminate its middle school grades and shift the school’s focus away from project-based, digital learning and become more of a traditional “college prep” high school. Students, teachers and parents left the meeting feeling conflicted. They were relieved the school wouldn’t close immediately, but were unsure what to think of the upcoming shift in school model. Already there have been changes. Earlier this fall, the private management company that oversees ChicagoQuest introduced its new CEO, Garland Thomas-McDavid, who previously worked as the founding principal of a Noble Network of Charter Schools campus. One of Thomas-McDavid’s first moves at ChicagoQuest was to hire two deans responsible for culture and discipline. Teachers say there is now more structure in place to follow a college readiness curriculum, and an emphasis on ACT preparation, which some students had been asking for. School leaders say they’ll try to retain some elements of the previous model and to be transparent about the transition. Thomas-McDavid assures the campus won’t turn into a replica of Noble, but says that there will be more attention paid to school culture and academic rigor. Dozens of students including junior Naomi Harvey-Turner turned up for the CICS board meeting to protest its possible closure. Students worried about transferring to a new school for their senior year. Wednesday’s decision raises questions about the viability of small and “innovative” charter schools that don’t perform well under the district’s accountability policy. CICS board members even wondered aloud whether they should create their own way of measuring the positive student outcomes ChicagoQuest is delivering but aren’t tracked in the CPS rating system. Last month the Chicago Public Schools Board of Education voted to close three charter schools, and next month it’s expected to vote to close a CICS campus in the Altgeld Gardens neighborhood. Earlier this fall, the CPS Board placed ChicagoQuest and nine other charter schools on an academic watch list and threatened to close the schools following the 2016-17 school year if they do not improve significantly. Andrew Broy, executive director of the Illinois Network of Charter Schools, says the challenges at ChicagoQuest have little to do with the district’s accountability policy, which relies on metrics such as test scores, attendance and graduation rates. During Wednesday’s meeting, CICS leaders and staff admitted that it’s been a challenge to implement the school’s original vision, where learning is like a game and students are problem-solvers. Administrators and staff blamed lack of consistent leadership at the campus, high teacher turnover and limited support for new staffers who are not familiar with the model. ChicagoQuest, which was modeled on a school in New York City called Quest to Learn, came to Chicago in 2011 with the help of a $1 million grant from the MacArthur Foundation to support digital learning initiatives. “Our goal in supporting the creation of ChicagoQuest was to give students the opportunity to learn both traditional and 21st century skills and to prepare them for success in college and future careers,” MacArthur spokesperson Sean Harder said in a statement. The games-based approach to pedagogy grew out of research and design experiments that have been shown to have a positive impact on students’ engagement and academic outcomes, he said. Shapiro, who is now director of programs, schools, and partnerships for the organization Institute of Play, says there needs to be ongoing professional development for teachers and school leadership that supports the model as a way to drive academic achievement. After Wednesday’s vote, CICS board members asked the students, parents and teachers in the room to help lead the changes at ChicagoQuest. In particular, they asked for help with recruitment. “Yes, the parents who like it, love it, but there’s not enough people to make the system economically viable,” said board member Gerald Jenkins. Enrollment has been declining at the campus, and only about 30 percent of its 8th-graders choose to continue into the high school, CICS officials said. In total, the school had just 225 students this fall, compared to 295 a year earlier. Under the new, high school -only model, the campus would need about 245 students to break even, CICS officials say. Board chairwoman Laura Thonn said that CICS can’t keep “kicking the can down the street” if fewer students show up next year. And if the academic performance doesn’t improve, then CPS could decide to shut the school down next year anyway. Harris, of the teachers union, says that CICS leadership should take more ownership for the problems at the campus, which is managed by a private company called ChicagoQuest Schools. 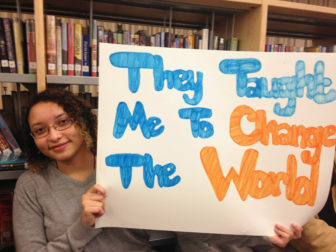 Nia Jones, a junior at the school, agreed. Visibly upset as she walked out of the meeting, she said in an interview that CICS administrators should do more to ensure ChicagoQuest’s success, and not just put it on the people in the building. “Yeah, we said we’d help, but you have to do work as well,” she said.